If you’re looking for cutting edge technology, style and most of all increased hygiene in your kitchen, I have the faucets for you! 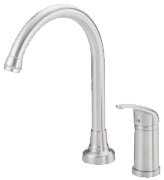 So far, I have included a couple of touchless kitchen faucets from two of the best known manufacturers in the US (possibly the world). One of the best features about a motion detection kitchen faucet is the fact that you don’t have to touch it in order to get running water. This really does make life around your kitchen much easier, and cleaner! If you think this type of faucet might be right for you, feel free to take a look. They include a good many other features aside from motion detection.